It will be 2015 Couva Clásico II in next Friday’s First Citizens Cup final at the Ato Boldon Stadium. Last night at the same venue Bankers Central FC and Direc TV W Connection thumped their semi-final opponents to earn their shot at the rich payday. 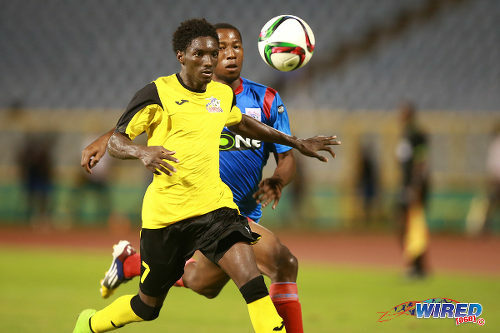 Connection outplayed and dominated a wasteful Morvant Caledonia United outfit to run away 3-0 winners while Central gave Club Sando a demoralizing lesson in finishing as they ran up a convincing 4-0 scoreline. 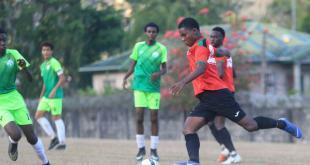 Photo: Central FC striker Willis Plaza (centre) prepares to drive past Police FC goalkeeper Adrian Foncette (left) while defender Jibiri McDavid looks on in the 2015 Pro Bowl semifinal. 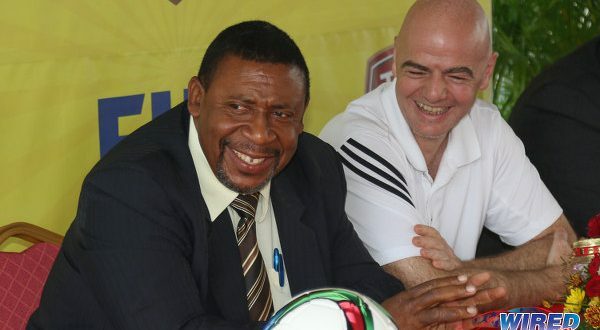 Just over a month ago, an Andre “Dr Dre” Ettienne piledriver gave the “Couva Sharks” a narrow 1-0 win in the season opening Charity Shield so that the “Savonetta Boys” will be hoping to turn the tables on them come Friday. The aggressive Central defender was not missed on defence or offence last night as his teammates did the business at both ends of the field. But Central’s decisive 4-0 victory may not be a true reflection of last night’s second semi-final as right from the get-go Club Sando let the two-time reigning FCB champions know that they were in a contest. The high-energy start put the 700-plus spectators in the mood, looking forward to a good battle between the southern David and the central Goliath. Within the first 15 minutes, Central attackers Willis Plaza and Jason Marcano had both already gone close but two minutes later their supporters’ hearts were in their mouths. 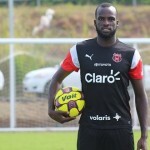 Their teammate Kaydion Gabriel slashed at a right-sided cross by Sando striker Kevon “Showtime” Woodley and came within a couple inches of sending the ball into his own goal. From the ensuing corner, Sharks’ hearts were made to flutter some more when Sando right-back Akeem Humphrey thumped a right-footed volley goalwards, forcing Central captain and Soca Warriors custodian Jan-Michael Williams to produce his best to keep it out of the net. Photo: Club Sando player Akeem Humphrey (left) gets between the ball and a St Ann’s Rangers opponent in 2015/16 Pro League action. But Plaza soon made the southerners rue their failure to make any concrete of their early, hard running. In the 22nd minute, he collected a clever pass from left-back Kevon Villaroel and gave Sando their first lesson in clinical finishing, slapping home a devilish left-footed shot from just inside the penalty area. Central doubled their lead just eight minutes later but not before Williams had produced in the 26th minute another fine intervention to prevent the charged-up Woodley from levelling the scores with a header from point-blank range. 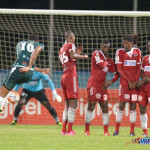 But Kelvin Henry in goal for Sando could do nothing to stop the Sharks’ second item after the silky Marcano checked inside Sando left-back Kemuel Rivers and blasted a left-footer into the net. 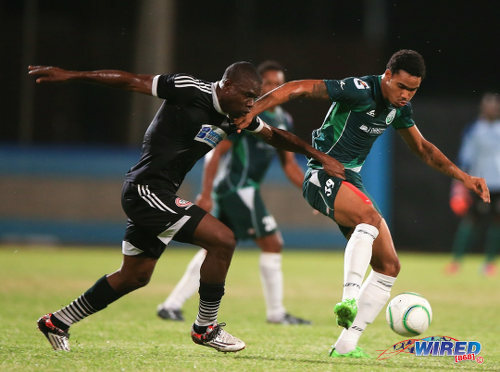 Photo: Central FC utility player Jamal Jack (left) harasses W Connection player Alvin Jones during the 2015 Caribbean Club Championship final. The brisk pace of the exhilarating first half might have been too much for Sando and Central duly took full control of the midfield at the start of the second period. Veteran midfielder Marvin Oliver and speedy winger Darren “Chucky” Mitchell were firmly in charge as Central mounted smooth build-up after smooth build-up to keep a hungry Plaza well serviced. He and “Chucky” both had good early chances to extend Central’s lead but both underwhelmed with their attempts on goal. Just before the three-quarters mark, Central finally managed to notch an insurance goal. Marcano and Oliver combined to work a slick corner routine to set up an unmarked Plaza for a simple finish in the box. That third item knocked almost all the stuffing out of their opponents and Central dominated the ball possession after that. “Showtime” and Sando’s feisty midfield leader Anthony Parris tried their best to grab a consolation for their side but they could find no way past the resolute Williams, leaving the Sando supporters frustrated and disappointed. And it didn’t make their night any better when, after a patient but pleasant build-up, veteran striker Kerry Baptiste coolly lobbed Henry in the fourth and final minute of stoppage time to put an exclamation mark on the night’s proceedings. 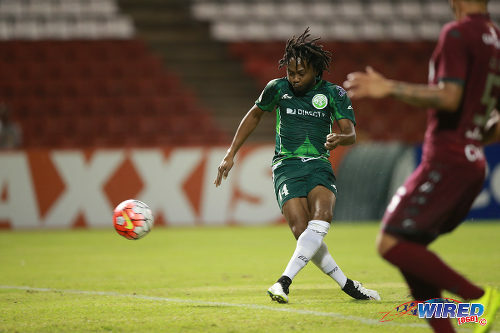 Photo: W Connection attacker Andre Toussaint blazes wide in 2015 CONCACAF Champions League action against Deportivo Saprissa. In the first semi-final, Connection were no less dismissive of Caledonia. The “Eastern Stallions” sat back in the early stages of the all-important semi and allowed Connection to assume total control. But the tactic of absorbing pressure and attempting to hit on the break did not work well for Caledonia because “Savonetta Boys” Jomal Williams and Neil Benjamin Jr were virtually unstoppable down the flanks. Nearing the half-hour mark, Williams and fellow attacker Shahdon Winchester eventually converted the possession advantage into something concrete in the scoreline, notching goals within seconds of each other. Veteran playmaker Andre Toussaint added a nice solo goal in the third minute of stoppage time to seal the contest with a third item. 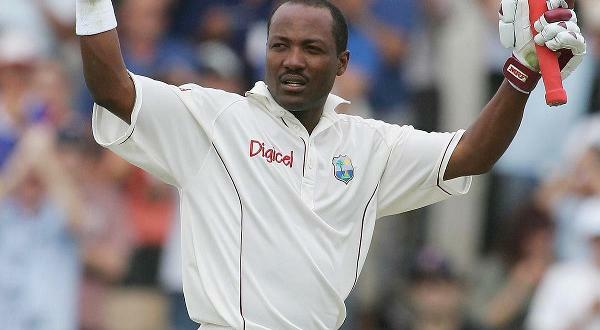 So we are set for another mouth-watering “Couva Clásico” next week, Goliath versus Goliath. 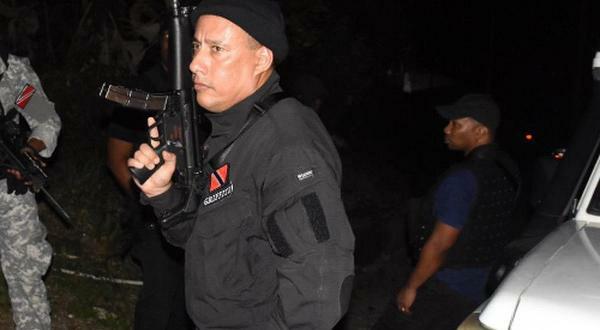 Will the Savonetta Boys be able make it safe to go back into the water again by disposing of the threat of the Couva Sharks? Or will “Dr Dre” once more drop the beat on Connection? Central FC: (4-2-3-1): 21.Jan-Michael Williams (GK) (capt. ); 15.Kaydion Gabriel, 17.Marcelle Francois, 12.Jamal Jack, 24.24.Kevon Villaroel; 10.Marvin Oliver (23.Jean-Luc Rochford 87), 22.Leston Paul; 7.Jason Marcano, 8.Sean De Silva (25.Elijah Manners 78), 11.Darren Mitchell; 33.Willis Plaza (6.Kerry Baptiste 73). Unused Substitutes: 30.Akel Clarke (GK), 14.Nicholas Dillon, 26.Jem Gordon, 99.Marcus Joseph. Club Sando: (4-1-4-1): 34.Kelvin Henry (GK); 7.Akeem Humphrey, 22.Coneal Thomas, 17.Jared London (15.Amritt Gildharry 81), 6.Kemuel Rivers; 5.Devon Drayton; 9.Jesse Downing (10.Kevon Neaves 65), 11.Teba McKnight, 4.Anthony Parris (captain), 24.Devon Modeste; 16.Kevon Woodley. Unused Substitutes: 33.Alexei Julien (GK), 8.Jeromie Williams, 18.Shane Hospedales, 20.Keith Williams II, 21.Kerron Mitchell. 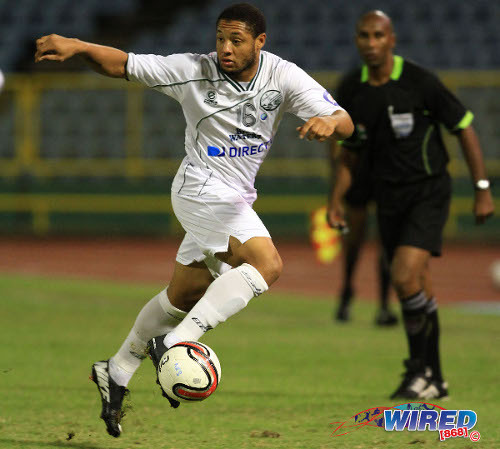 Central FC 4 (Willis Plaza 22, 64, Jason Marcano 30, Kerry Baptiste 90+4), Club Sando 0, Ato Boldon Stadium. What’s the scene with Guerra ? Wasn’t a dominating or convincing performance by Central. I’ve seen them played better many times. Friday will be interesting to see how they deal with each other’s contrasting style. Roneil K Walcott well then he needs to reward himself with hitting the back of the net.